Anyone with a large, multi-level home or office knows that a single Wi-Fi router doesn’t always provide coverage in every room. In my case, we recently moved into a 90-year-old house with very solid walls. The router in the living room is barely visible to the iPad when I’m reading in bed, so the connection is slow, if it works at all. We also don’t want a printer in the living room so a wired solution in one of the back rooms is required. Stringing a new Ethernet cable would be possible, but not fun. I tried several models of Wi-Fi repeaters in the past, and tested newer models when we moved into this house, but their performance and reliability were not acceptable. Fortunately, like most houses today our place was wired with coax cable for television in every room years ago. Now a new Rochester NY company called wi3 has come out with an amazingly simple product called WiPNET. I don’t know why it took so long for someone to figure this out, because the whole thing is so obvious, and simple. The photo at right show a single WiPNET device. This mounts in the wall like a standard electrical outlet, typically wherever your cable TV connection comes out of the wall. The WiPNET box has two coax connectors and two Ethernet jacks. 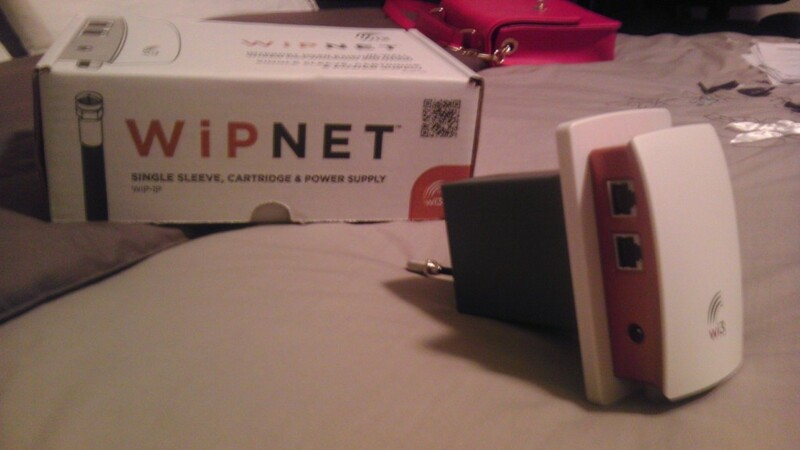 I set up one of the WiPNET devices near the television in the living room, where I also wanted the Wi-Fi router. This was also a convenient place since I had one coax cable TV wire coming in to the WiPNET box, and a second coax cable TV wire going out of the WiPNET box and on to feed the rest of the house. A standard Ethernet cable was run from the router to one of the Ethernet connectors on the WiPNET device. A second WiPNET box was placed in one of the back rooms near a desktop computer and network printer. This device was connected to the cable TV connection in that room, and then the cable box was hooked up to the second coax connector. The computer and printer were connected to the two Ethernet jacks on the WiPNET device and, like magic, they were wired into the router in the front of the house. After testing the setup for a few days I connected a second Wi-Fi router to the WiPNET device in the back of the house. That signal is strong enough to cover the backyard as well as the rooms. The company is new and the last time I checked in they didn’t have any retail distribution set up yet. But several home audio/video dealers around the country are carrying the products. I ended up purchasing from Design Tech Electronics in the Washington DC area. For more information visit the wi3 website. Hi Robert. I have access to dealer-level pricing on this product, thinking abouit using it at my home too. If you have customers for this, hit me up and I’ll be happy to source it. Jade Communications did a great job with the wiring in our home. They were terrific and very professional. Nice guys, very trustworthy, and a great recommendation for anyone in Boca Raton. Check them out at http://www.jade-com.com/.